You are here:Home / Archive by category "Entertainment"
Great Events: LA Fall Brewery Art Walk…Save the Date! If you’ve seen some Ewoks or Wonder Woman lyrca-strapped ladies pass by you in the LA and OC area lately, it’s probably because it’s Comic Con. The massive international event has been gathering fan boys, geeks, gaming/comic/film/science fiction/anime/cosplay enthusiasts for years and San Diego is ripe again for another round as the epicenter of global pop-culture fandom. Join us at Great Over Good in Santa Ana (not Mexico) for a night of Bluth-themed art, frozen bananas, and all the Arrested Development references you can handle! Feel free to don your finest banana suits, $3,000 suits, $5,000 suits, or orange jumpsuits. Never-nudes, never fear! Cutoffs are welcome as well, as long as they effectively hide your thunder. Doors open at 6pm. $15 at the door. If you purchased your presale tickets online, please bring your ID to the show. We will not be mailing out tickets. If you have any questions, email us at Info@greatovergood.com. The holidays are here! 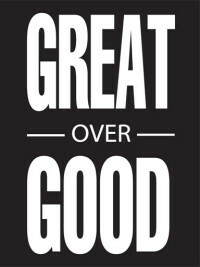 Come celebrate GREATNESS at Great Over Good next Saturday. You know, assuming the world doesn’t end.